Trains Gain Steam In Race To Transport Crude Oil In The U.S. Oil production in the U.S. is booming, and that's making it harder to get crude oil from the field to the refinery. With pipelines filled to capacity, energy firms are turning to rail networks. Trains Gain Steam In Race To Transport Crude Oil In The U.S.
A Norfolk Southern train pulls oil tank units on its way to the PBF Energy refinery in Delaware City, Del. As U.S. oil production outpaces its pipeline capacity, more and more companies are looking to the railways to transport crude oil. On a quiet fall morning in the Delaware countryside, a lone sustained whistle pierces the air. Within moments, a train sweeps around a broad curve, its two heavy locomotives hauling dozens of white, cylindrical rail cars, loaded with 70,000 barrels of crude oil. It's a scene playing out with growing frequency across the United States and Canada. The U.S. is awash in oil, due in large part to advances in drilling techniques such as hydraulic fracturing, or fracking. U.S. production hit a 24-year-high in September. Yet there is a challenge getting the crude from the field to the refinery. Most oil is moved by pipeline and, five years ago, refiners pinned their hopes on the Keystone XL project. The 1,700-mile, Canadian-built pipeline would carry millions of gallons of crude oil from Alberta, Canada, south to refineries along the Gulf Coast. But the Obama administration has yet to decide whether to allow the project to go forward, in large part because of environmental concerns. In the meantime, soaring production in the U.S. — especially light sweet crude coming out of North Dakota and Texas — has outpaced U.S. pipeline capability. So oil refiners and producers are turning increasingly to other transportation networks to move crude: barges, trucks and, in particular, railways. The use of rail cars to ship crude is growing enormously, jumping from 9,500 carloads in 2008 to 234,000 carloads last year, according to the Association of American Railroads. Canadian National Railway says moving crude oil by rail is one of its fastest growing businesses — despite increasing questions about rail safety, especially in the wake of a deadly crash in Quebec last July, when an oil train derailed, killing dozens of people. Sandy Fielden, an analyst with RBN Energy, says that hasn't slowed down refiners wanting to move oil. It's less expensive to transfer crude by pipelines, but that can be offset by storage costs refiners have to pay if the pipelines are too congested. Fielden says laying rail track or upgrading refineries for trains is not as expensive as building a new pipeline. He says railways also require shorter and less rigid agreements with refiners. "They only need to commit to about two years' worth, compared to 10 to 15 years on a pipeline — which means there's much less risk," says Fielden. Michael Murray, a Roman Catholic priest in Elkton, Md., has studied and written about the rail industry for 40 years, and knows some of the best vantage points for spotting trains and studying oil refineries along the East Coast. On a recent morning, he peers across an open field overlooking the PBF Energy refinery in Delaware City, Del. From here, a mile-long Norfolk Southern train being unloaded is visible. Murray says the railroad recently reconfigured its tracks outside the refinery, apparently to better maneuver the oil trains. PBF Energy says it installed new oval tracks — which Murray calls "loops" — at the refinery to more efficiently unload the large amounts of oil coming in by rail. "The loops ... can at present unload 20 to 25 tank cars at a time," he says. "They're able to unload 70,000 barrels of oil in about eight to 10 hours." 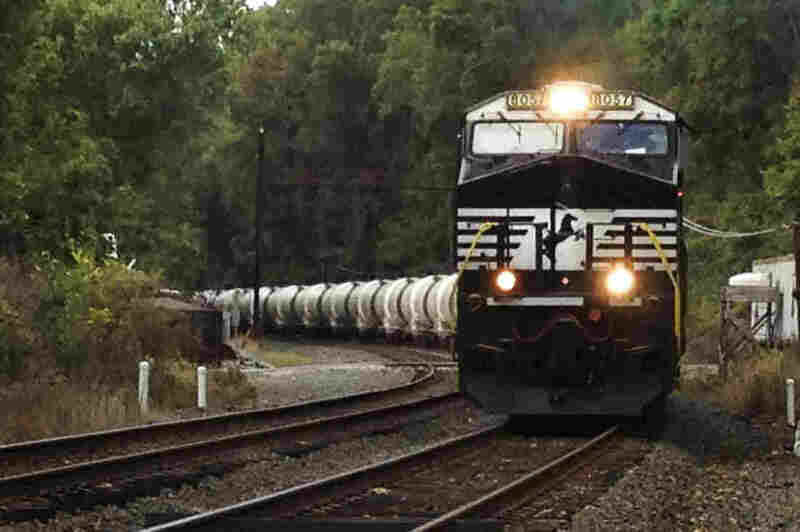 Murray says the mile-long oil trains — often called "rolling pipelines" — don't really stop. "In the 2,000 miles it takes to get from ... North Dakota and Canada to here, the only time they stop is to refuel the locomotives and to change the crew," he says. "They are hot trains ... nothing gets in their way." Texas-based Valero Energy is one company that's increasingly relying on rail. It signed on to use the Keystone XL pipeline several years ago to ship heavy Canadian crude to its terminals on the Gulf Coast. But spokesman Bill Day says given the long delay to build pipeline, Valero began buying rail cars and reworking some of its refineries to bring in trains. Day says Valero likes having alternatives. "We like getting oil from different sources. If we can bring it in by ship and by pipeline and by rail, and even by truck in some instances, that gives us more flexibility," he says. "The more options we have, the better off we are." Day says given the amount of oil being produced these days, even if construction of the Keystone pipeline went ahead tomorrow, Valero would continue to use rail.